Shabby Apple has the most darling clothes! They offer upscale clothing and accessories for little girls, teens, and women in affordable prices. Shabby Apple's speciality is their fabulous dresses. 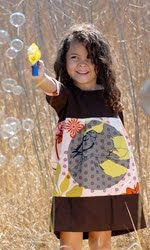 For little girls the clothes are available in baby, toddler, normal childrens and preteen sizes. For women the clothes are available in junior/misses and plus sizes. Some of the clothing is very vintage in style. Others are classic and some are modern. All of their items are beautiful - unique and trendy. I have mentioned before on this blog that I am the worst shopper ever. I love shopping and can take all day making a decision. I love comparing items and finding that PERFECT item. Because of this lovely trait of mine, I am sure I drove the nice people at Shabby Apple just a little crazy. I have to say though that they were professional, courteous and accommodating when trying to help me pick the perfect dress. At first I wanted to pick something for Miss. C. As a teen, her taste and mine don't really mesh. She is also more of a tomboy than a girlie type, so I decided if we were going to get this fabulous dress to review, I wanted to be the one to get it as I would appreciate it more. Unfortunately I could not make up my mind on what I wanted. I finally decided the easiest thing would be to get a dress for the little girls - they would both appreciate it AND wear it. I debated whom to order for. I showed the girls the Secretary Dress and both loved in in blue. We (I) decided Miss E. could get the dress Initially I intended for Miss E. to wear the dress as her birthday is coming up. Because of the size I ordered a size up. I have a bad habit of worrying things will be too small and ordering a size up. The bad thing is my kids often walk around with baggy shirts that have sleeves a tad too long. I should not have done this with this dress - the website actually tells you if the size of the item you are ordering runs small, true to size or big. Of course old habits die hard - I ordered a size up and it was too big for Miss E. but fit Miss N. (she is small so it is slightly large on her). Of course this did not go over too well with Miss E. - crying, whining, etc. - but Miss N. was thrilled. I explained to Miss E. that she would get the dress when Miss N. outgrew it. As you can see Miss N. LOVES her new blue dress - this is actually more of a blue/green patina turquoise. Instead of wearing the bow in front, Miss N. prefers to wear it like a scarf. (if she turns you can see the scarf). It is a soft cotton and looks cute with boots. As she grows this will also look great with leggings. After all the painful decision making I am pretty happy. Miss N. looks darling and between the two little girls, we are sure to get a couple of years use out of this dress. Shabby Apple is looking for a fabulous designer - possibly you. In their Dare to Design competition, artists and designers can post their idea of a beautiful Spring dress on their personal blog. The 15 top designs will be featured on their blog and be voted on by Shabby Apple blog readers/visitors. The winning design wins! Details can be found HERE.